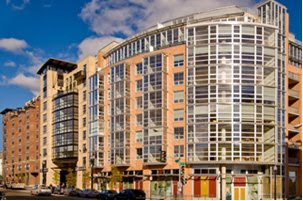 Union Row (2125 14th St NW, 20009) is a PN Hoffman project comprised of two complexes: the Flats and the Warehouse. The latter is a renovation of two pre-existing warehouses. The project won the National Association of Home Builders (NAHB) 2008 Pillars of the Industry award in the category of "Best New Loft Condominium Community." ...is new 8-story, 216-unit condo building in the heart of the U St. corridor, starting at $270k for a studio, to $1.2m; one-bedroom condos from the high $300's, two-bedroom condos from the low $500k's, though the project has seen several drastic price cuts since the building was finished, most recently in January '08. Some units will offer floor to ceiling windows and glass bays in a glass-dominated facade, which should offer city views. The sales office reports that the project has sold more than 80% of its units, the first delivery took place in Fall 2007. Now selling, the Warehouses at Union Row features 52 split-level and single level 'townhouse style' condos in a converted and expanded warehouse - 2 parallel buildings separated by a courtyard, with some 3-level condos featuring floor to ceiling windows. Condo prices ranged originally from $495k to over $1m, with the multi-level upper units starting at $864k, but prices dropped in early 2008. Sales began in early 2006, the first deliveries took place in November 2007. According to the District, 115 of the Flat's 216 units have sold through April 2008; 16 of the Warehouse's 52 units have sold in that time. Not quite the 80% puffed by the sales office. The table below lists all sales recorded by the District (use the scroll bar on the right to browse the table). The original owner of unit #703 has met the greater fool. After having purchased the unit, a 1/1 with 700 square feet, for $398,900 in January 2008, someone actually bought it from her for $425,000 in April. Granted, this unit includes one of the fifty parking spaces available in a building with more than 200 units, but does that warrant a $26K bump in less than four months when 100 other units in the same building are still available? I can imagine what many other would be DC condo sellers who are reading this are asking: does he have any friends? My new BFF tells me that one unit, #304, is listed for sale [MLS #DC6814242]. It's a 1/1, 700 sq feet with a parking space. Originally purchased for $352,634 in September 2007, this Union Row pioneer thinks $425,000, a $72,366 profit after a 10 month holding period in a DECLINING market, is a reasonable price. Too bad the greater fool has already purchased #703. I've not found any units listed for rent. A parking space is available for $280/month. This article in the NY Times moves me to tears. Wall Street bankers can no longer get home loans using their as yet unreceived year end bonuses to qualify for a mortgage. The folks who played a large part in the housing debacle are actually paying a price for it now. ALMOST overnight, investment bankers and others on Wall Street have gone from being Manhattan’s most aggressive apartment buyers to real estate pariahs. As financial services companies continue to cut jobs and bleed billions of dollars, their employees have far less cash to spend on high-priced apartments, and very little optimism about taking a risk right now anyway. Those in the financial industry who still want to buy real estate are often unable to persuade lenders and co-op boards to work with them. The biggest problem is that buyers who work on Wall Street no longer have the guarantee of huge bonuses to bolster their financial status. And even those who continue to get bonuses are finding that banks and co-ops will not let them count all that money as part of their income, because unlike a salary, it can fluctuate wildly. The bonus situation is expected to get worse before it gets better. Alan Johnson, the managing director of Johnson Associates, a company that tracks compensation data, said that Wall Street bonuses are projected to be 30 to 40 percent lower in 2008 than in 2007. “It’s going to be the toughest year in at least five years,” he said. He predicts that bonuses will not pick up until 2010. The problems facing buyers from Wall Street won’t necessarily cause Manhattan apartment prices to slide drastically, said Diane M. Ramirez, the president of Halstead Property, though they could result in slightly less competition for properties and prompt more sellers to negotiate. Yeah, you bet. "Workers in financial services-related businesses make up roughly 25 to 30 percent of Manhattan buyers, according to estimates by Halstead Property" and prices won't suffer. Supply and demand doesn't apply to Manhattan, I guess. This time it's different. Please help me pass these folks a petard. No one deserves it more. 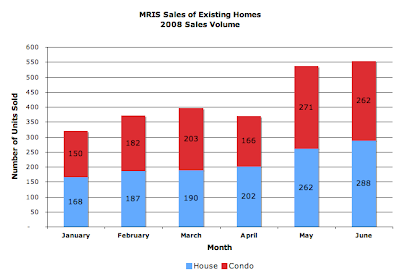 MRIS has released its data for signed sales contracts for existing home sales in June 2008. Compared to June 2007, fewer units sold, dollar volume was lower, but average prices for condos and single family homes rose. Units sold: 550, down 19.59%. Average sales price: $ 571,055, up 6.35%. Median sales price: $ 425,000, up 2.41%. Slightly more than 8% of units  sold for more than $1MM. Amazingly, 26 4 bedroom homes sold in the $1MM - 2.5MM price range. 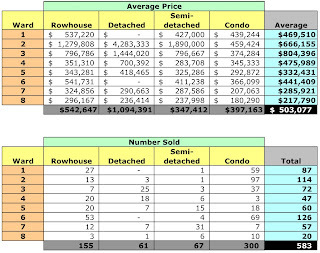 Seven condos sold for more than $1MM; of those, three sold in the $2.5MM - $4.5MM price range. Compared to May, the number of condos sold fell 3.32% while home sales increased 9.92%. With a few exceptions, for almost every category of housing reported by MRIS unit sales and dollar volume have fallen dramatically YoY. 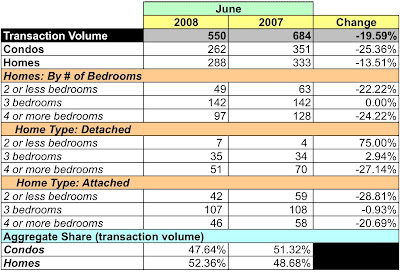 Condos are down 20.34% on dollar volume and 25.36% on unit volume. 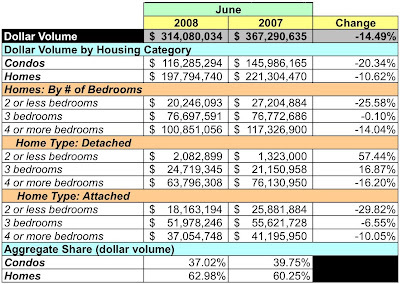 Homes down 10.62% on dollar volume and 13.51% on unit volume. 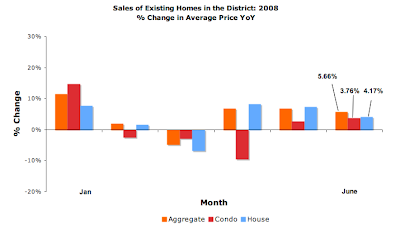 In aggregate, the average price in the District has risen 2.61% in 2008 [June compared to January]. Compared to January 2008, June's average prices for condos are up for the year [+4%] while those for homes have risen 2.15%. 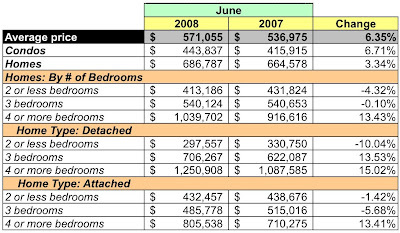 Based on June's sales volume, there's now 6.21 months of inventory for condos and 6.59 months for homes, decreases of 0.54% and 9.17% from May 2008. Compared to June 2007, the number of condos listed has fallen 5.5% while rising 18.9% for homes. 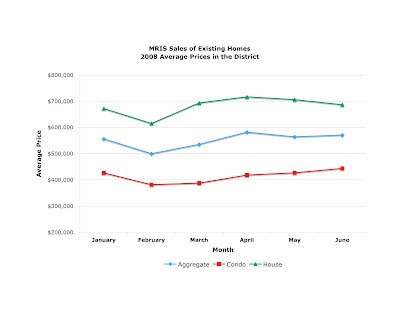 I thought it'd be interesting to see March's sales activity on a by-neighborhood basis [see below]. Using the neighborhood names recorded in the District's real property sales database, it's apparent that much of the District's sales activity is occurring in the Old City I/II and R.L.A. SW neighborhoods, which account for about 35.5% of recorded sales.